Two departments at the Royal Marsden Hospital could reopen within days of a fire destroying part of the building. The outpatients department and the medical day unit at the leading cancer treatment centre in west London are expected to open on Monday. Staff were earlier allowed back into part of the building following the serious fire on Wednesday afternoon. A hospital spokesperson reported that the damage to the building was "not as bad as first suspected". An administrative centre has been set up in the building where clinical teams have been contacting patients by phone. Staff hope to resume dispensing chemotherapy in the medical day unit on Monday. Radiotherapy will be carried out at the hospital's sister site in Sutton. Cally Palmer, chief executive of the Royal Marsden NHS Foundation Trust, said: "We are working as quickly as possible to get the Chelsea hospital up and running. "We have brought in professional contractors to assist our own teams to clean up the hospital and to get our patient areas ready for business again. "And by the end of next week, we also hope to bring back on stream some of our wards that are unaffected by the fire." Five operating theatres and two wards were badly affected by the blaze, which swept through the building on Wednesday. Patients will continue to receive their treatment from Royal Marsden specialist teams either at the Royal Brompton Hospital or in Sutton. During a visit to the Royal Brompton, Prime Minister Gordon Brown said the government would do everything in its power to fully reopen the site as soon as possible. 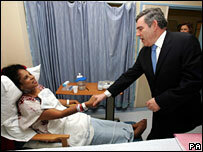 Mr Brown said: "The last 24 hours have seen Britain at its best." He praised staff for saving equipment and added: "We will now do everything in our power to make sure the Royal Marsden can be up and running as quickly as possible." About 800 staff and up to 160 patients were evacuated during the fire, including two patients undergoing surgery. Fire investigators are searching for evidence to establish the cause of the fire, which broke out shortly before 1330 GMT. 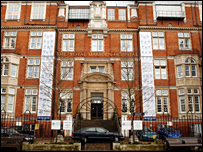 The Royal Marsden was the first hospital in the world dedicated to cancer treatment and research, and sees more than 40,000 patients from the UK and abroad every year.